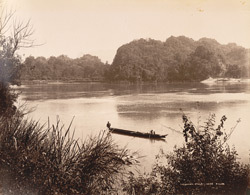 Photograph of the Salween River, Burma (Myanmar), taken by Philip Adolphe Klier in the 1890s. The Salween or Thanlwin is Burma’s second greatest river after the Irrawaddy (Ayeyarwaddy). Approximately 2400 km long, it rises in the Himalayas in Tibet and flows south through China and Thailand, entering Burma in the north-east. It passes through a series of deep gorges on its journey through Shan, Kayah and Mon States in Eastern Burma, and finally reaches the sea near Moulmein (Mawlamyaing) at the Gulf of Mottama (Martaban) on the Andaman Sea in southern Burma. Here the river opens out into a broad, shallow waterway. This is a general view of the river from an unidentified location.